Beautiful view of the countryside! 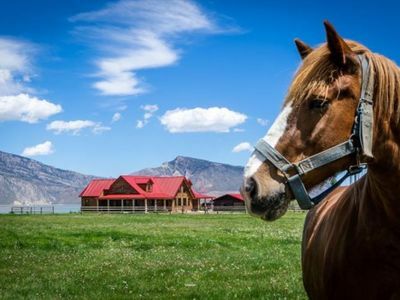 Wyoming adventure awaits at Red Roof Ranch. 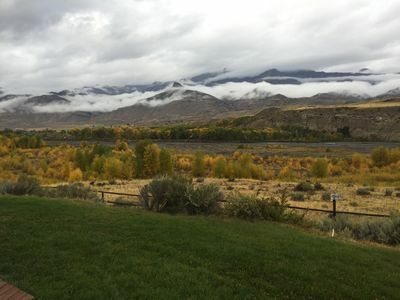 This gorgeous property sits in the middle of 15 private acres with views of the South Fork River Valley, Buffalo Bill Reservoir and surrounding mountains. 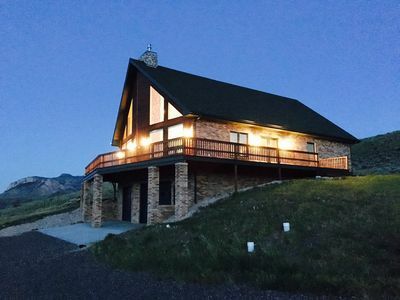 Sit outside on deck and watch the sunset over Sheep Mountain while enjoying the gas firepit. Or catch the sunrise over Cedar Mountain before a day in Yellowstone. 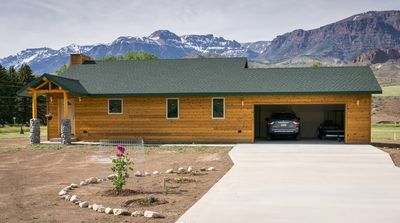 Inside, this custom home features a great room with log details, gourmet kitchen with all the amenities and dining space for the whole crew. There is a fireplace for cool evenings and a tv/blueray player (stream your own programming). 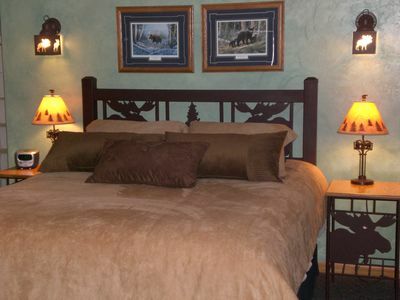 The main level master bedroom offers a king bed with views of the mountains, gas fireplace, desk work area (hopefully just to plan your excursions) and walk in closet. The attached master bathroom has a soaking tub and large tile shower. 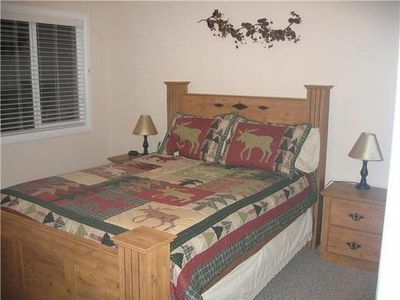 The second bedroom on the main floor has a queen bed, the bathroom is right across the hall. 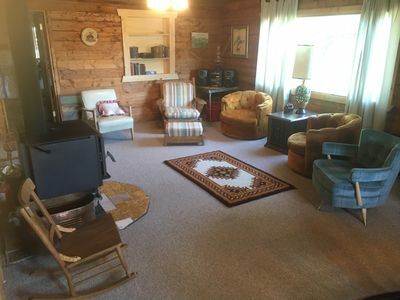 Also on the main level is the cozy den with 2 comfortable chairs, queen size sofa sleeper and smart tv for streaming your netflix or other subscription. 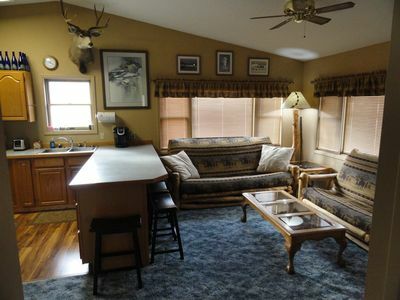 Upstairs you'll find 2 additional bedrooms with queen beds, one features huge windows with mountain views, the other a small deck (we think its the perfect spot to watch the mule deer in the yard) and desk area. The 3rd full bathroom in on this level. 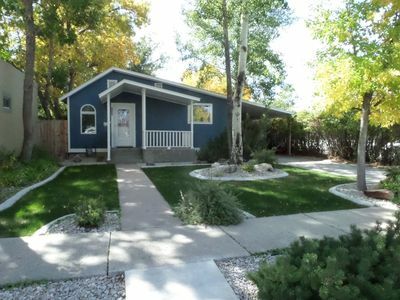 "Valley View Chalet", Newly Renovated, Clean, Modern & Best Value In Area. 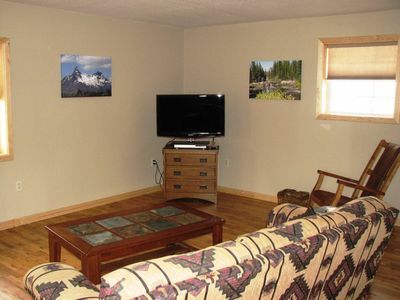 Cody Studio; rent with 'Grizzly' #4099255 & 'Grizzly Den' #1101893 to sleep 17!! 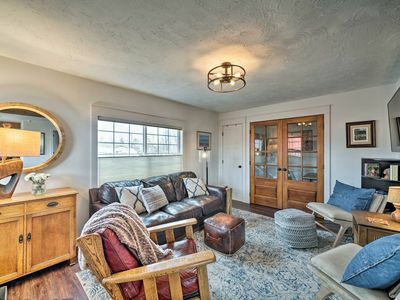 Cody Townhouse #4: Everything you need for a home away from home! A Favorite in Cody! 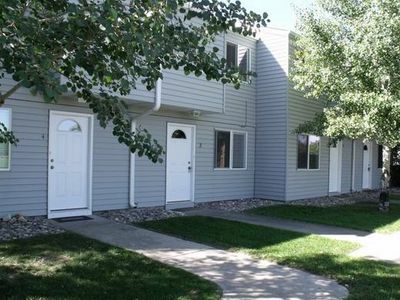 Townhouse #3- 50 miles from East Gate of Yellowstone! 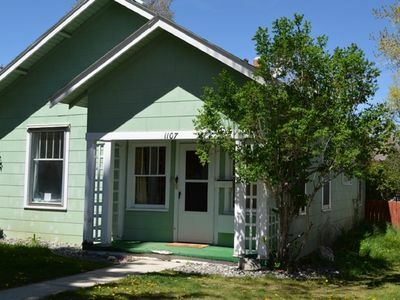 Newly renovated, pet-friendly home with breathtaking mountain views! 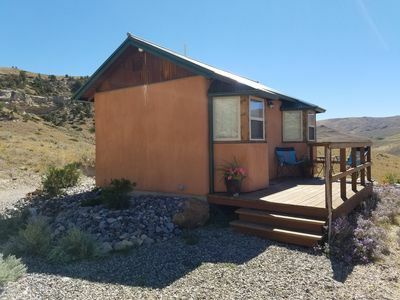 The Hideaway Is The Place To Stay For Privacy, Relaxation, And Seclusion. 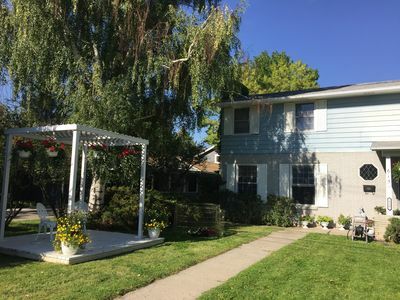 Rates Slashed for July, August & September! 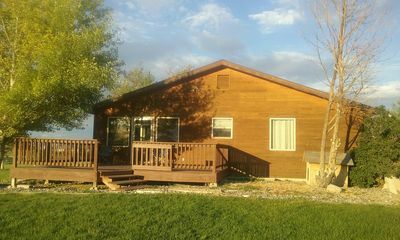 Sleeps 16- Rent with 2 Bdrm cottage! 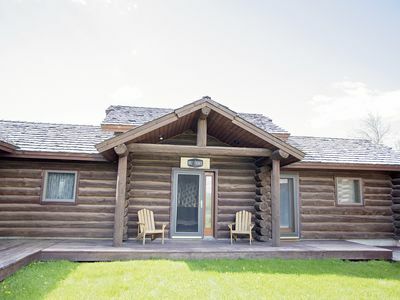 Absorb the beauty of Wapiti and enjoy the new Sundance Spa-Jacuzzi. 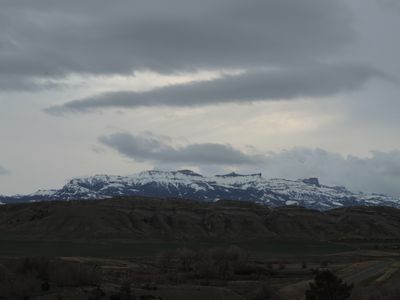 enjoy the wonderfull town of cody and yellowstone park! 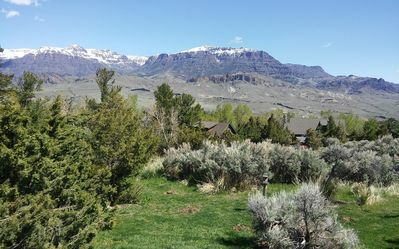 Located in the Heart of Yellowstone Country that accommodates 14 guests! 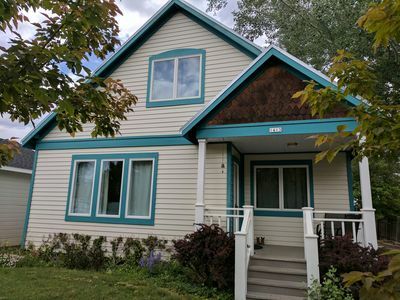 Cozy 2-Bedroom House in Downtown Cody! 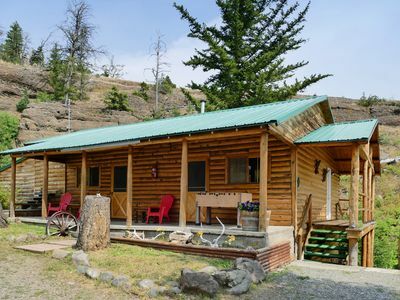 Wapiti cabin on Green Creek. 25 miles from the East Entrance to Yellowstone. NEW! Modern Downtown Cody Home w/ BBQ & Firepit!